If you come to my house, you will find at least one or two packages of frozen dumplings stored in my freezer any time of the year. I purchase them from the grocery stores, of course. 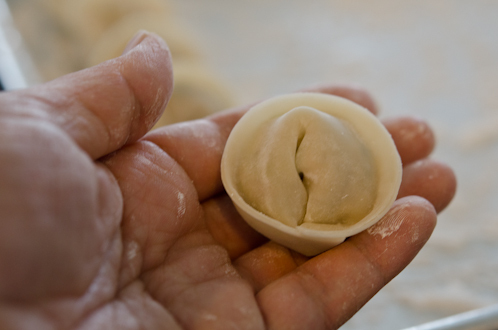 But during the New Year, I like to make home-made dumplings with my family. It is a fun activity that you can do with anyone – young or old, and you can store them in the freezer for later use if you can’t finish them all at once. 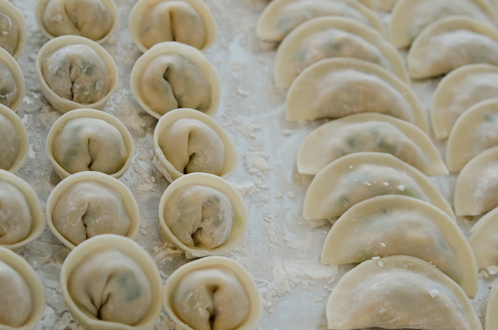 Koreans love dumplings. 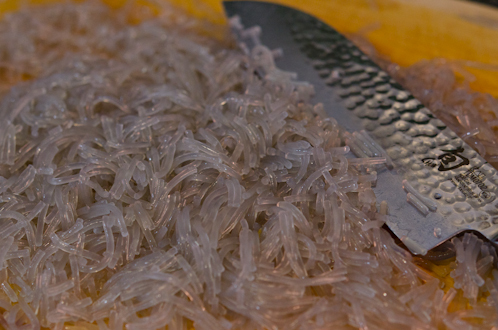 We steam them, pan-fry them, deep-fry them, boil them, and throw them into soups and stews. Yes, some even juggle with them (?). 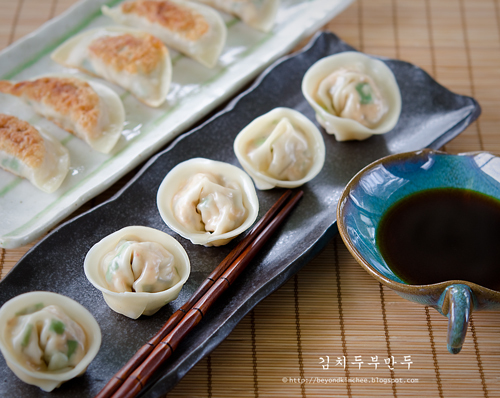 Here is Kimchi Tofu Dumplings recipe that use old fermented kimchi and tofu mixed with pork in the dumplings. You can omit the pork if you want to go all vegetarian. 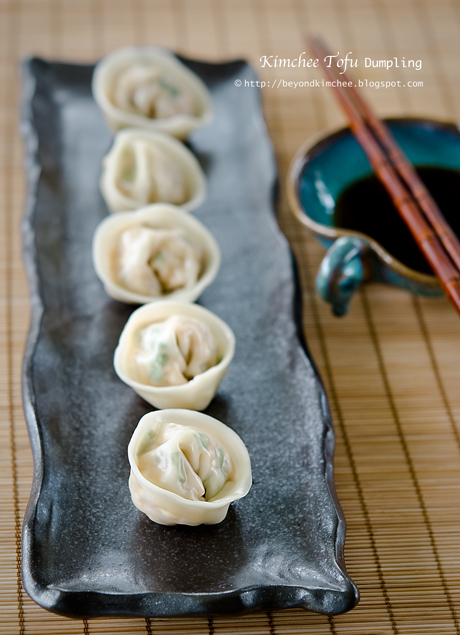 These dumplings are quite easy to make. 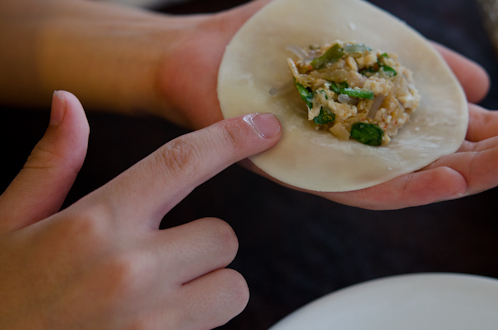 So, go grab a few dumpling wrappers at the store and let the party begin…! Here are the main ingredients you will need. 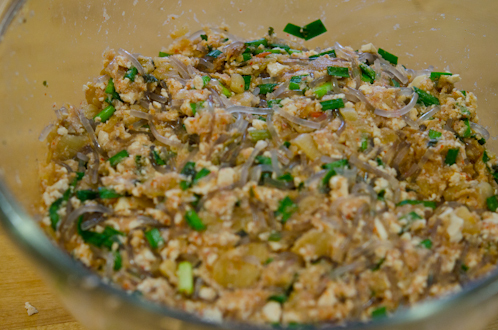 Kimchi (very old one), tofu, ground pork, Asian chives, sweet potato noodles (aka; dangmyeon). 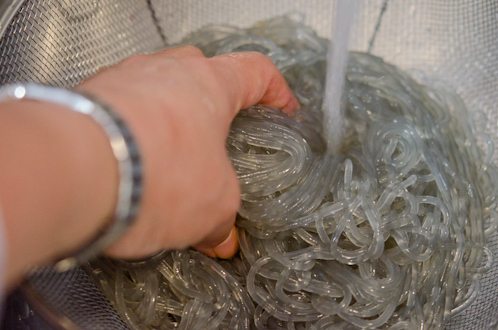 This is called “dang-myeon”, the sweet potato noodles. Any Korean groceries should have them. 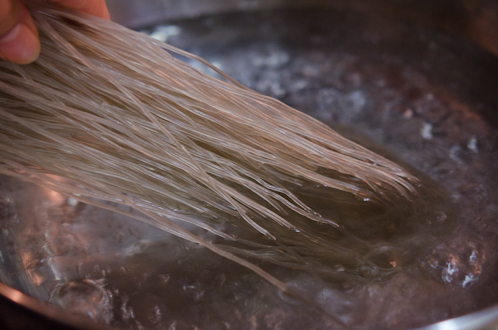 You can substitute with rice vermicelli if you don’t have time to search for it. Throw them in the boiling water and cook for 7-8 minutes. Rinse them under cold water, and drain well. And chop them into small pieces, of course. Set aside. 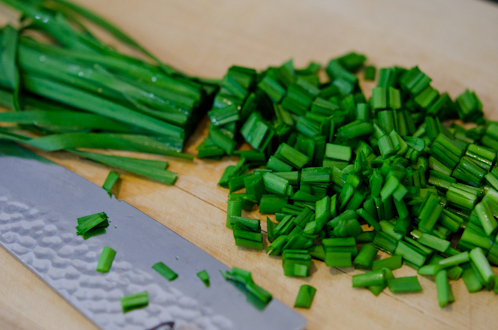 Chop your chives, too. You can substitute with green onion if you wish. 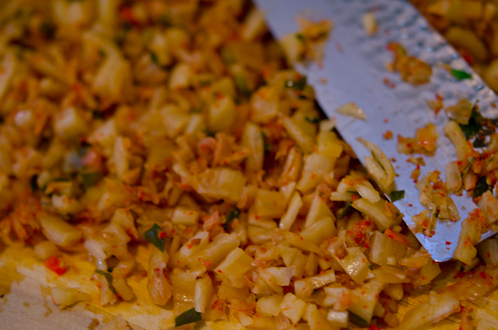 Squeeze out some moisture from the kimchi and chop them into small pieces as well. Put your tofu on the fine cotton cloth. 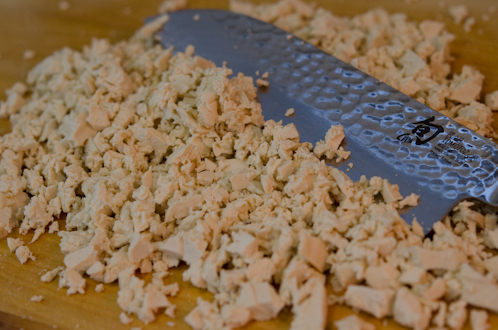 And squeeze him to death… This will remove water from the tofu. And chop finely. Set aside. 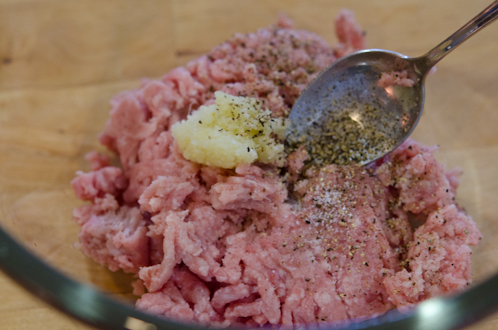 In a big mixing bowl, combine ground pork with garlic, salt and pepper, rice wine and mix well. Bring all the chopped ingredients into the bowl with pork and start tossing and kneading. I forgot to take a picture but you will need to add one beaten egg to bind all the ingredients. Now the filling is ready to use. 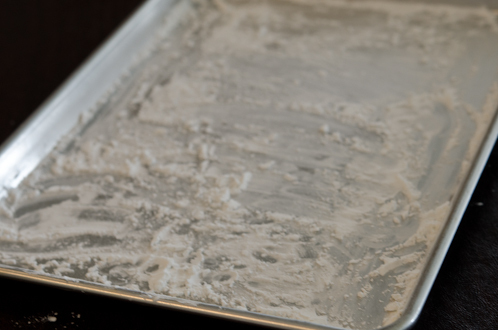 Grab a half sheet pan or large platter, and sprinkle with some corn starch. Mine is about 3″ in diameters. 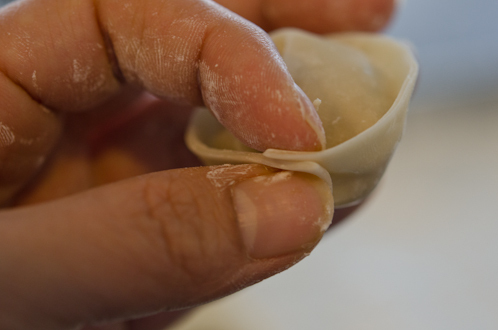 You can use any size you like and adjust filling amount on each dumpling to fit in. Make sure you cover the wrappers with damp cloth so they don’t get dry out. Now, It is time to call your kiddos, husband, or whoever you live with. Put about 1 1/2 teaspoonful of filling on the wrapper and wet the edge with water. Use your finger just like my 8 yr old boy did. Fold the wrapper in half carefully pushing down the filling. Pinch the edge together to seal. You have the half-moon shape here. I don’t do fancy fluted edges or anything like that. I like things simple and fast. This shape is good for pan-frying. If you want to go for a full moon shape, carefully bend the both corners to meet at the center. and bring the corners to over wrap a little, dab with water, and pinch tightly together to seal. Voila! You got the full moon! This shape is good for steaming and boiling. Let’s see how my kiddos are doing. You know, kids are funny in terms of making food. They don’t go by manual or instruction. They just want to make things their way, Period! We have a quite of dumpling collections here. If you want yours to look at their best, place them on a sheet in a single layer. You can freeze as is for later use. Quickly cover with a lid and cook for another 1-2 minutes. That way it will cook thoroughly without over browning them. 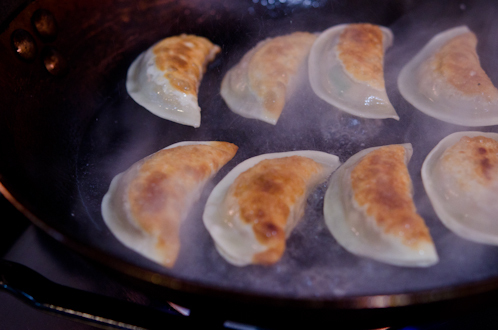 To cook your dumpling in boiling method? You just need to know how to boil the water. Throw them in the boiling water, cook for 3-4 minutes. When they are floating on top, they are done. Take them out and EAT. 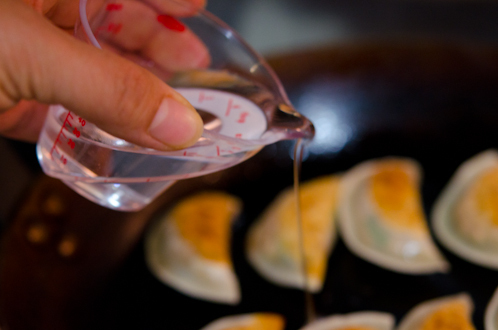 Simple soy sauce + vinegar dipping sauce is always nice to serve with. There is a VISA card. In a large mixing bowl combine the pork, garlic, rice wine, season with salt and pepper, and mix well. Set aside. 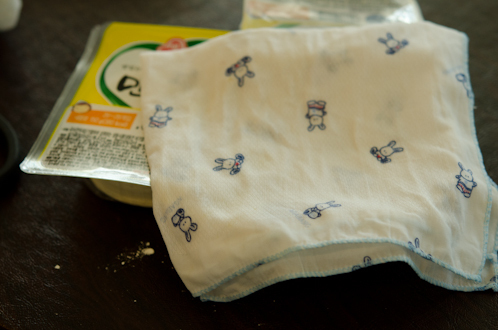 Place tofu on a fine cotton cloth and squeeze it to remove water from the tofu. Mash the tofu if needed. 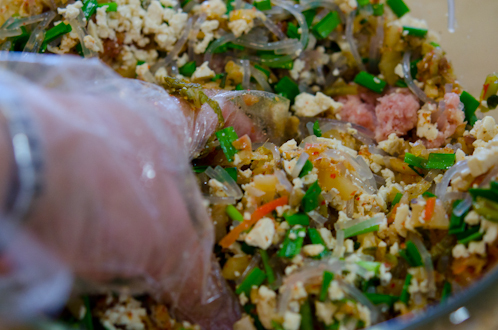 Add the noodle, kimchee, tofu, chives, and egg to the bowl with pork mixture and mix well. Season the filling with salt and pepper. 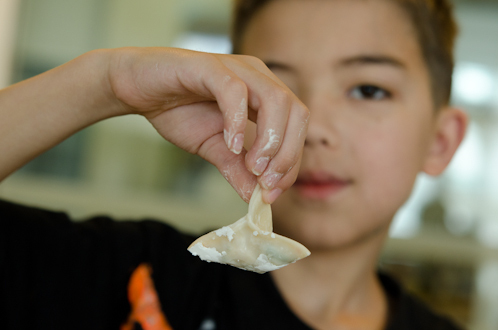 To make half moon shape; Place about 1 1/2 teaspoonful of filling on the wrapper. Dab some water on the edge of wrapper using your finger and fold in half. 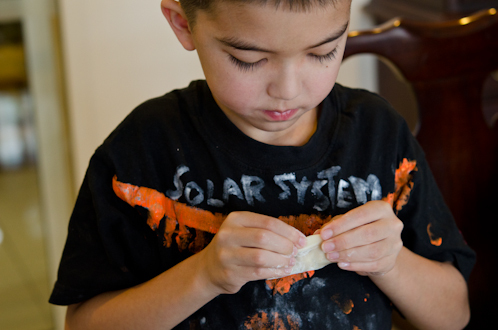 Pinch the edge to seal tightly. 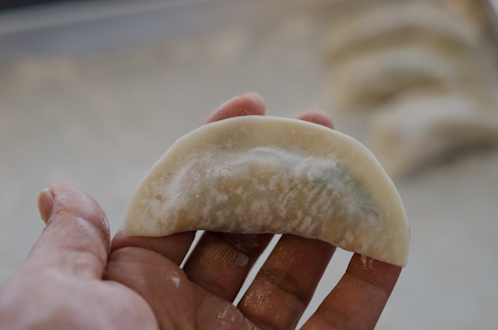 To make full moon shape; from the half moon, bring the bother ends to the center and over wrap the ends a little, dab the ends with water and seal tightly. Half moon shape is good for pan-frying and full moon shape is good for boiling or steaming. 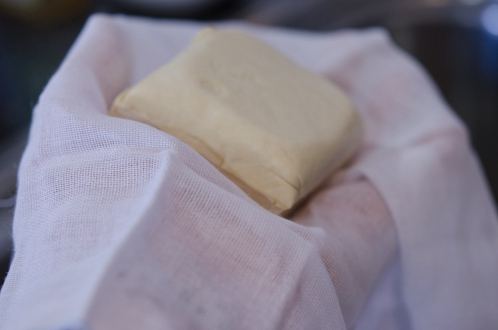 Note: Make sure you keep the wrappers covered with damp cloth to prevent them from drying out. Your dumplings are super neat and lovely! 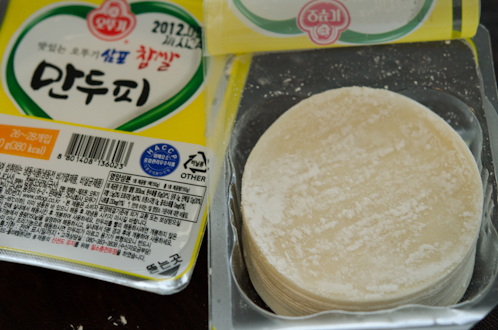 Next time I`ll try the full moon shape with the tofu filling. Thanks for sharing! Lovely posts (I'm just catching up on this one and your Thai trip pics)! 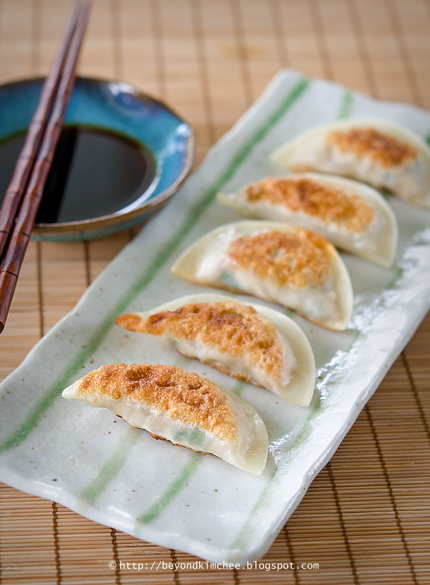 oh i LOVE dumplings (hence my name...haha!). This filling is so different to mine..can't wait to try it one day! What exactly is 'old kimchee'? I've never made these all by myself, I normally have my mom doing 99% of the work and I'm the helper! But, I'm going to make them this week. Thanks for the recipe and tutorial!!! Just "assembled" these with my mom and aunts for Sae Bae. Now I actually have the recipe! Thanks for sharing! Old kimchee is basically very fermented kimchee. Does it have to be old Kim Chee? The ones I have currently are rather fresh. Looks really yummy Holly, and i like how you let the kids make whatever shape they want - bet they had fun! I love dumplings of all types. These look wonderful. 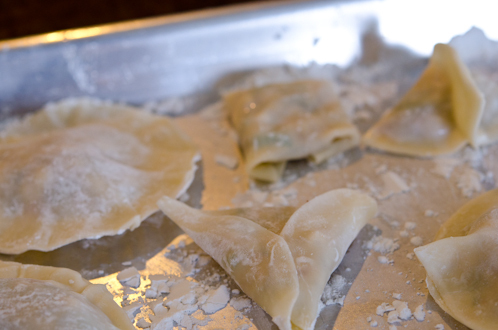 I've never made this type of dumpling before - why have I been wasting my life? Great instructions, great recipe - thanks much. Yes, it has to be very fermented. Fresh kimchee doesn't offer the enough pungent flavor. Thanks, Lucy. good to hear from you. Thanks for your blog. 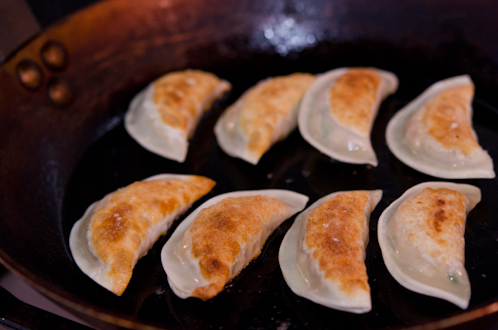 I made the veggie version of these mandu today with some old kimchee that was smelling up the fridge. They were very good, even though I forgot to put in the egg till we were halfway through stuffing the wrappers. 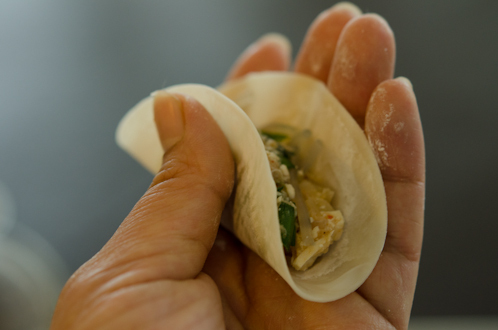 It was my first time to make mandu. I also made the cucumber muchim. 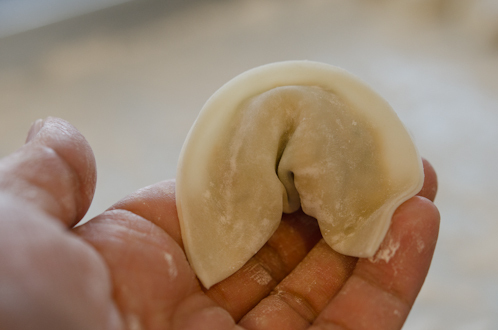 I am glad that you tried making mandu. Egg is not the most important ingredient so it is okay if you missed out. Thanks for the comment. Ahn Nyeong Hah Seh Yo! I am glad that you found my blog, too. Hope some of these recipes will make you happy. I am a Hong Kong Chinese. I happened to come across you blog when I was in a restaurant. I like your blog very much. 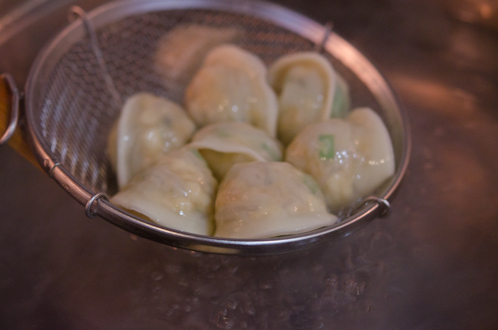 And the dumplings look so good that I must either try it out or pick it up in some Korean store. By the way, I would like to make myself a blog like yours so that I can do some sharing. I tried to go into blogspot which did show me how to compose a blog. But it did not show me how to have tabs like what you have -- home, about, recipe index, etc. Can you tell me how to do it or point me to where I can get to know how it can be done? Thanks. 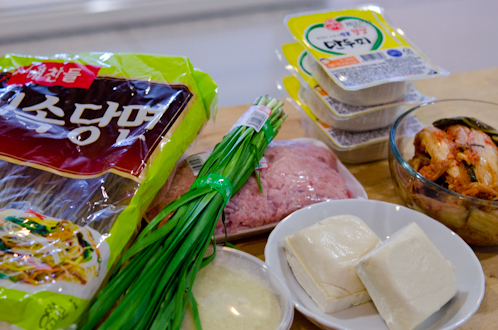 I just made these and am about to eat a big plateful of pan-fried/steamed ones :o) I had extra filling so I rolled it up in some cabbage leaves and it is baking in the oven...Korean-style cabbage rolls, I guess? Thanks so much for all your lovely recipes! Thanks Renee. I love the idea of using cabbage and bake in the oven. What a great idea! You are quite creative.